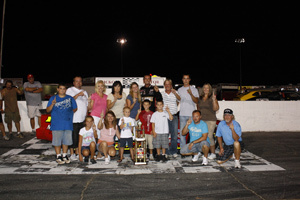 ( Newton, NC - - August 14, 2010 ) It was all about the fans during Sig's Tire Center Fan Appreciation Night, as fans benefited from discounted tickets, contests, at-track give-aways and experience some fast paced racing action from the NASCAR Whelen All-American Series. The night included a special 100-lap feature from the Bojangles Late Models along with racing action from the Advance Auto Parts Limiteds, the Everything Attachment Super Trucks, the Hickory Street Stocks and the Hickory 4-Cylinders. The No. 10 of Andy Mercer found his way back to victory lane after a two week winless streak. 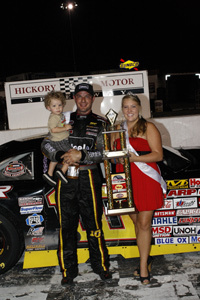 The Bojangles Late Models entertained the fans during their 100-lap feature event with the No. 51 of Josh Wimbish bringing the field to the green flag. The No. 43 of Jesse LeFevers was hot during the first half of the feature taking over the lead on lap five from Wimbish. LeFevers and Wimbish traded the lead back and forth until LeFevers pulled away on lap nine. The No. 10 of Andy Mercer grabbed the second place position on lap 12, leaving Wimbish to ride around third. The No. 5 of Dexter Canipe Jr. worked his way into the top five by lap 16, bringing the No. 92 of Candace Muzny along for the ride. Canipe Jr. took over the fourth place position on lap 20, with Muzny cracking the top five on lap 22. Mercer and LeFevers began a tight battle for the lead on lap 29, exchanging the lead until lap 37 when the first and only caution fell after the No. 2 of Jessica Brunnelli spun heading out of turn one, sending her car hard into the outside wall. Mercer led the field to the green. 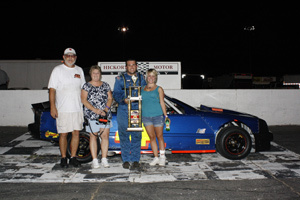 The restart worked out in Canipe Jr.'s favor putting him in position to take over third. Muzny made her way back into the top five by lap 46 and began working on Wimbish for fourth, moving into the position on lap 55. As Muzny continued to move towards the front, Canipe Jr. and LeFevers maintained a battle for second with Canipe Jr. settling into the spot on lap 70. With 20 laps to go Muzny had reeled in LeFevers as she set her sights on the third place spot, grabbing the position on lap 88. Wimbish quickly darted around Muzny to take over third on lap 93, leaving Muzny to ride around fourth. Mercer grabbed the checkers with Canipe Jr., Wimbish, Muzny and LeFevers rounding out the top five. The excitement started early during the Advance Auto Parts Limiteds 35-lap race when the No. 37 of Landon Huffman and the No. 15 of Sheflon Clay connected heading into turn two just as the field took the green. Clay's ride went for a spin collecting the No. 37 of Travis Sigmon bringing out the first caution. It was smooth sailing, until lap seven when a second caution fell due to debris on the track. A tight battle for the lead continued all 35 laps, beginning with the No. 5 of pole sitter Dexter Canipe Jr. and the No. 07 of Tyler Church. Church grabbed the lead on lap 10, but Canipe Jr. stuck by his side until lap 12 when he regained the lead, leaving Church and the No. 28 of Keith Bumgarner to battle for second. Bumgarner grabbed the position on lap 14, causing Church to ride around third. Just as Bumgarner settled into second he set his sights on Canipe Jr. looking for a shot at the lead. It didn't take Bumgarner long to move out front, taking over the position on lap 19. On lap 25 a third caution fell as the No. 21 of Monty Cox rolled to stop on the back stretch. The No. 8 of Mark McIntosh was on fire making his way into the second place position by lap 27, pushing Canipe Jr. into third. With five laps remaining Canipe Jr. rallied back moving back into the second place spot. 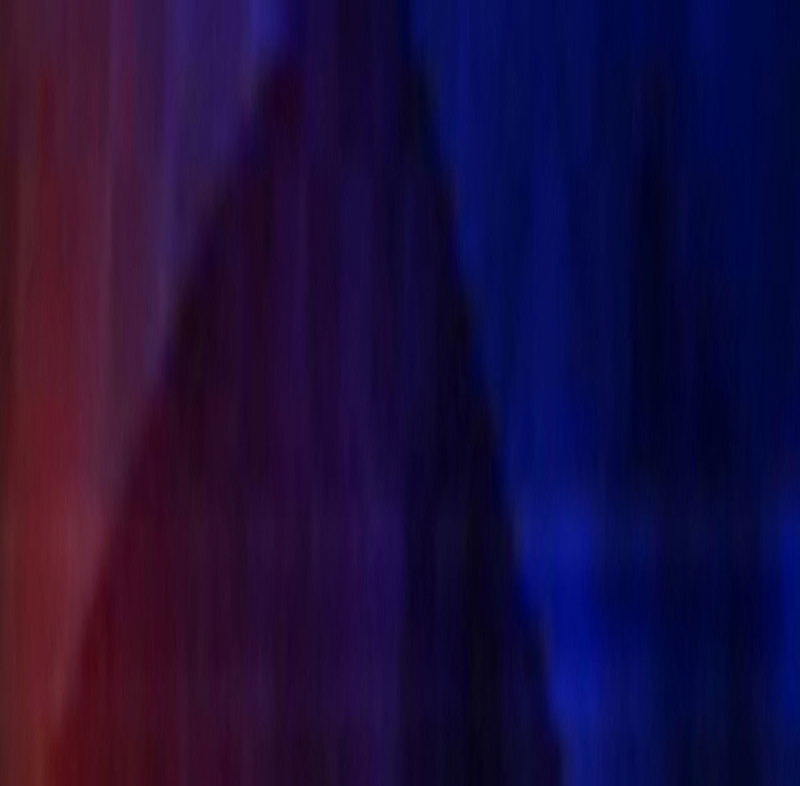 Caution number four waved on lap 31 when the No. 09 of Kenneth Pardue spun around heading out of turn three colleting the No. 22 of Brian Murphy and the No. 03 of Russell Stillwell. The No. 83 of David Hasson spun to avoid the stalled ride of Pardue, but made contact with the front end of Pardue's ride. The red flag was brought out to give track officials and safety crew members an opportunity to clean up debris on the track. Track officials didn't like what they saw during the restart bringing out the fifth and final caution. Bumgarner continued out front as the field made a second attempt to go green flag racing leaving Canipe Jr. and Church to duke it out for second. The two ran side by side during the final laps, but it was Canipe Jr. who would inch ahead to grab the second place spot, leaving Church to come home third. McIntosh and the No. 11 of Matt Piercy completed the top five. 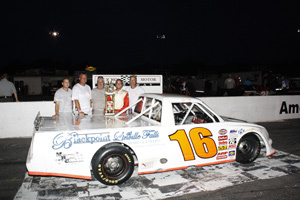 The Everything Attachment Super Trucks took to the track for their 35-lap feature with the No. 16 of Clint Fields in the pole position. The No. 98 of Jody Measmer quickly jumped out front grabbing the lead on the second lap. The No. 33 of Jeremy Birch made his way into the top three within the first five laps. By lap ten Birch and the No. 28 of Jason Crouse had developed a tight battle for third until lap 14 when Birch, Crouse and the No. 25 of Mark Johnson went three wide coming out of turn two. The move caused Crouse to lose momentum allowing Birch to pull away. On lap 22 Johnson worked his way back up front moving into the third place position. The first caution of the race fell on lap 24 for debris on the track. The restart proved beneficial to Fields as he regained the lead when the field went back to green flag racing. The second and final caution waved on lap 28 after Birch went for a spin coming out of turn three. At the restart Measmer was squeezed out of line and pushed back to the third place position, allowing Crouse to jump into second. Fields powered on, coming home first. Crouse, Measmer, Johnson and the No. 6 of Brandon Setzer finished second through fifth respectively. The Hickory Street Stocks hit the asphalt for their 30-lap caution free feature with the No. 9 of Charlie Watson leading the field to the green. The No. 64 of Marshall Sutton made his way into the fourth position on lap nine allowing the No. 03 of Kevin Eby to run in fifth. The No. 21 of Roger Pitts II grabbed the lead from Watson on lap ten. The field began to spread out and ride around in cruise control. Pitts II brought the field to the checkers with Waston, the No. 1 of Taylor Stricklin, Sutton and Eby making up the top five. 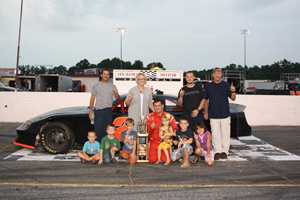 The Hickory 4-Cylinders capped off Sig's Tire Center Fan Appreciation Night with a 25-lap caution free event. The No. 6 of Caleb Sisk experienced mechanical misfortune on lap 11, bringing his night to an early end. The No. 4 of pole sitter Adam Beaver and the No. 18 of Devon Haun ran together for the first 20 laps until Haun also ran into mechanical issues, ending his chances at a win. Beaver continued out front until he saw the checkers. The No. 21 of Todd Harrington, the No. 17 of Curtis Pardue, the No. 52 of Michael Isaac and the No. 98 of Rob Lewis followed behind to finalize the top five. Hickory Motor Speedway will be taking a break next Saturday, but will be back in action on Saturday, August 28 th for Autism Speaks Night at the Races presented by Pepsi Max and S&S Exteriors. The Night will include appearances by the NASCAR Whelen All-American Series with racing action from the Bojangles Late Models, the Advance Auto Parts Limiteds, the Everything Attachment Super Trucks, the Red Baron Race Parts Hobby Stocks, the Ford Focus Midget and Twin 20-lap features for the Hickory Street Stocks. Grandstands open at 5 PM, with qualifying immediately following. An On-Track Autograph Session will take place at 6 PM with feature racing action beginning at 7 PM. Tickets are only $10 for adults, $8 for teens and seniors, $5 for kids ages 7-12, with kids 6 and under FREE. Remember if you not here… you're missing out! *Disqualified due to failure to pass post race technical inspection.